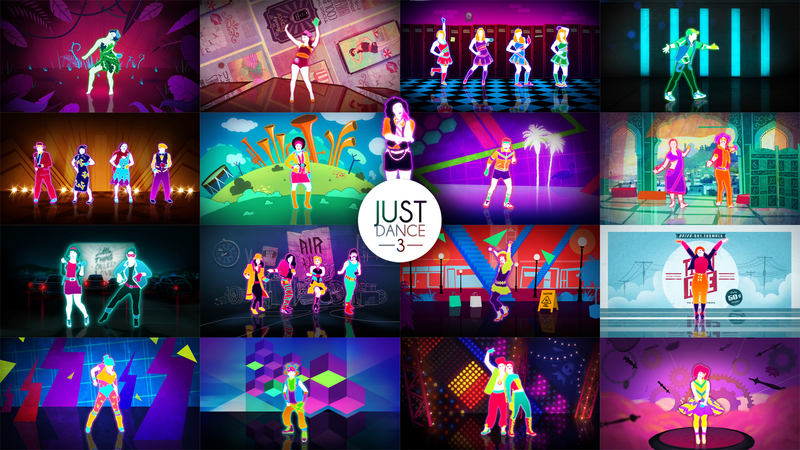 "Let’s Go To The Mall" by Cobie Smulders (credited as Robin Sparkles) is featured on Just Dance 3. The dancer is very detailed. She wears a yellow hat over her dark pink hair. She also wears a mint green necklace with a gold medallion on it. When she does the Robot, her outline becomes bolder and more pixelated. In the remake, she has a magenta outline, and she fades in and out with a different effect. Her outline no longer becomes bolder when she does the Robot. The routine takes place in a mall with some blue escalators, potted plants, and shopping bags. There are also other customers and a lift carriage. During the bridge, some maple leaves float around. Towards the end of the song, the other customers start dancing. In the remake, less maple leaves float during the chorus. Gold Moves 1, 3, 4, and 5: Raise your right hand and bring it down diagonally with a strike. Gold Move 2: Do the Robot. The bags in the background have the Canadian Leaf on them because the character, Robin Sparkles, is Canadian. The maple leaves also honor Robin Sparkles's nationality. Cobie Smulders is the singer but she is credited as Robin Sparkles, her role in How I Met Your Mother. The lyrics misinterpret "hair like Brettsy" as "hair like Gretzy", and Brian Mulroney’s surname is misspelled as "Mulrooney". Additionally, "So I had to bust a crazy move" appears as "So I had to bust trés sweet moves". On Wii and PS3, trés appears without the graphical accent. Even though the song is from the 2000s era, it appears in the "Just 80s" playlist. This also happened was in Video Killed the Radio Star and I Was Made For Lovin’ You, which are from the 1970s but are featured in the same playlist. The coach wears a different styled belt on the menu icon. The dancer lip-syncs "Let's go to the mall everybody!" at the beginning of the song. The coach's bracelet on her left wrist blends in with the background. In an early version of the routine, the plants and lights were positioned differently, the bags did not have the maple leaf (with one of them being the color white), and there were floating turquoise triangles. Also, the coach's glove, heels, and necklace were red. The avatar of the dancer in Just Dance 2014 has long necklaces, which results in a part of the pendant being cut off when you use the avatar. The necklaces are shorter in the Just Dance 2015 version. Part of the routine is taken from the clip of the song taken from the TV show. The costume is also similar to what Robin Sparkles is wearing, only in different colors. The song is shortened at the end by a few seconds.